Saltigo GmbH, a subsidiary of specialty chemicals company LANXESS, will be presenting its comprehensive expertise and longstanding experience as a reliable custom manufacturing service provider and producer of multi-customer products at Chemspec India 2018, which is being held in Mumbai from April 25 to 26. 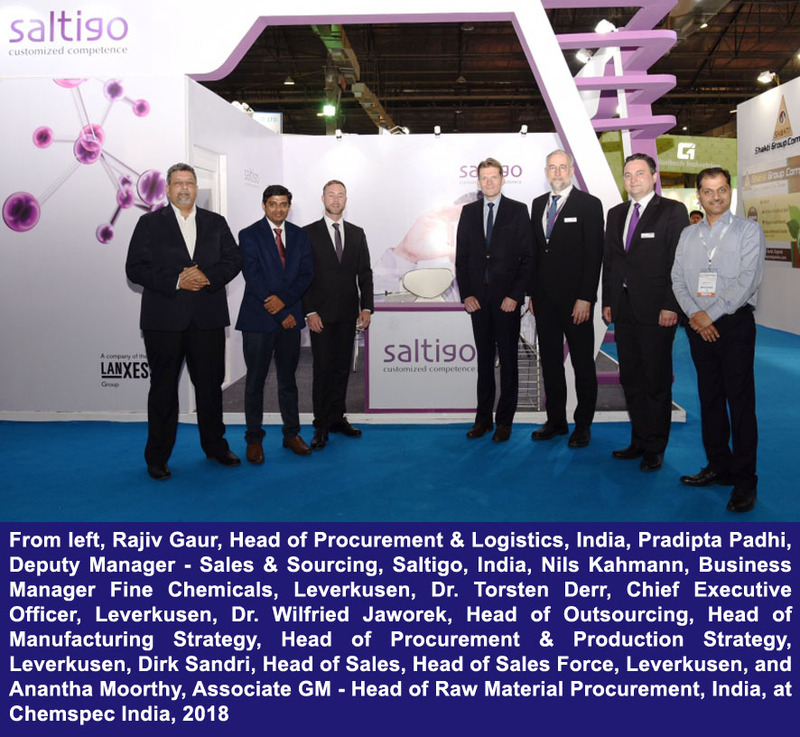 “Saltigo has been participating in Chemspec India since 2010 and our presence here this year, too, only showcases our absolute confidence in the market potential that the Indian market has. We are aligned with our business targets and are working towards expanding our activities in the pharmaceutical and agrochemical segments. We look forward to strengthening our business with selected multi-customer products. We have also been successful in attracting customers from the specialty chemicals segment, where outsourcing is not yet a common practice, to our portfolio,” says Torsten Derr, Managing Director of Saltigo, summarizing the company’s plans. Combining an exhibition and conferences, this tradeshow is an important event in India offering buyers and sellers of high-quality chemicals, based on complex synthesis requirements, the opportunity to further develop business partnerships and to initiate new business. “Our participation underlines the value we place on this important market and presents our company as a reliable supplier of chemical intermediates and partner for custom synthesis manufacturing with an efficient project management. Saltigo is a problem solver capable of shortening time to market, which is nowadays an important differentiation factor in the chemical industry,” says Christoph Schaffrath, Head of Key Account Management at Saltigo. While in the past, India has been seen as a target for procurement and sourcing, the country is nowadays also a rapidly expanding market in the field of fine chemicals and active ingredients for pharmaceutical and crop protection applications. “We can support growth in custom manufacturing in particular, as this is our core competence,” says Dirk Sandri, Head of Sales at Saltigo. Key areas of expertise here include phosgenation and halogenation – such as reactions involving hydrogen fluoride or phosphorus chlorides and the Halex reaction. Further examples are metal organic syntheses, e.g. by means of a Grignard reaction, which is run at Saltigo in a multi-1000 ton-scale including the production of the reagent. “Also for our multi-customer products such as phosgene derivatives or 1,2,4-triazole, India is an important market. In addition, we strive for business with innovative companies specializing in photovoltaics, polymers, lubricants, flavor and fragrances and biocides,” he adds. In addition, Saltigo is awaiting the registration of its insect repellent Saltidin (chemical name Icaridin) in India. Insect repellents containing the active ingredient of Saltigo protect against infection with dangerous diseases, like the Zika virus or dengue fever, by keeping mosquitoes at bay. Saltigo has reacted fast to the increased demand by increasing the production capacity significantly and has taken measures for additional capacity expansion. Saltigo supplies products to some 150 customers from the agrochemical, pharmaceutical and fine chemicals industries. These include active ingredients and intermediates for crop protection agents and medicines together with chemicals for numerous applications, such as the tried-and-tested insect repellent active ingredient Saltidin. Saltigo offers manufacturing opportunities based on complex chemistry and technology needs having passed an FDA-audit. The extensive know-how in implementing technical customer requirements and developing and optimizing custom-made processes in extremely well structured chemical parks in Leverkusen and Dormagen is one of the reasons why high-profile companies in many countries around the world choose the LANXESS subsidiary, Saltigo, as a full-service supplier which shows a high commitment to quality, safety and environmental protection. Detailed information about Saltigo’s services can be obtained online at www.saltigo.com.